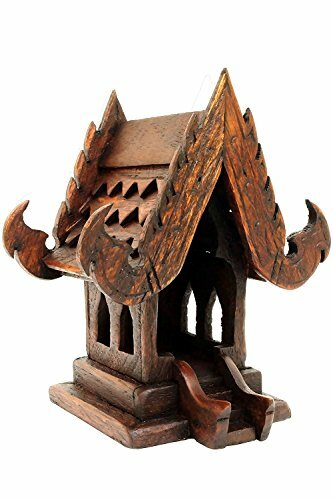 Thai Spirit House "SanPraPhum" that is the Wooden Model of Thai Buddhism Temple always put infront of the House to invite the Good Spiritual , God to stay to Protect out family. Some of Western People used this kind of art pieces to be home decoration. If you want to used to be the "SanPraPhum" for God stay you must pray and wish to ask him to stay by use the five joss sticks and ask by trustful i beleived by this process the God or Good Spiritual can know your wish... if you have the good Buddhism people that can pray the Buddhism word will be better. And if you invite some God stay you must give the food and drink every days then you will received the good result for life , family , Job. Dimensions: Length - 3 inches, Width - 4 inches, Height - 5 inches. Hand Craft made by skilled artisans from Thailand. "Wood Carving and Handmade All Unit". If you have any questions about this product by Unique Thailand, contact us by completing and submitting the form below. If you are looking for a specif part number, please include it with your message.